This Fish Design is perfect for all the fishermen in your life. 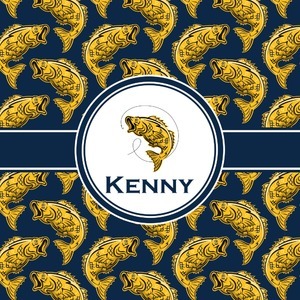 The design is shown with yellow fish on a navy blue background. However, both the background and fish colors can be changed Through the center of the design, there is ribbon with a label. The label contains a fish and hook graphic, but this graphic can be changed to a different fish or other graphic. Just like the fish and background, the ribbon and label color can be customized. Personalize this design by changing the colors, graphic and putting your own name or other text.